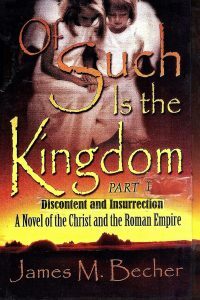 Intriguing historical fiction novel of Biblical and Roman times developed from a prize-winning story. A powerful blending of stories of seekers from different walks of life who might have lived then. Step back to Ancient Jerusalem at the time of Christ and the Roman Empire, and ask: What could a cynical, non-conformist dry-goods salesman, a disgruntled blacksmith, and a musing mendicant all have in common? The answer: Down deep, they all seek something better. But will they find the true fulfillment they are seeking? The non-conformist, Manaheem, Herod’s foster brother, is hired by Herod to foment an insurrection against Pontius Pilate, whom he distrusts. Manaheem recruits the blacksmith, Barabbas, to be the insurrection leader, to the dismay of Barabbas’ Godly but fearful wife (when he finally tells her). The mendicant, an unfortunate but pensive young man named Timotheus, joins with an older beggar completely unsympathetic to his musings. Pontius Pilate sees himself as a weak ruler, but his wife pushes him to be stronger and to even take over Herod’s territory. Manaheem re-unites with his former wife, Claressa. In need of more money, he tries to blackmail Herod over the latter’s illicit affair but fails. Read the book to see why. Herod’s palace is attacked, and suspecting Pilate, he tells Manaheem to go ahead with the mission. Will the insurrection succeed? Buy the book to find out. James M. Becher was born on June 8, 1943, of a Christian family and accepted Christ at an early age. Interested in writing and drama since High School, he graduated from Grace L. Hill Memorial Christian School, where he participated in several plays and got A's in English Grammar. His interest in writing caused him to write several short stories, poems, and articles. He went on to attend St. Petersburg Jr. College, in St. Petersburg, FL. for two years. While attending a Bible Club on Campus, he found out about a writing contest that he entered and won second prize, with a Biblical short story, called "Beggarman-Thief." After Jr. College, he attended Bob Jones University, in Greenville, S.C., where he acted on their radio drama series, "Miracles." While there, he felt the call of God to preach. James obtained his B.A. degree in Bible-Lit at Clearwater Christian College, and went on to the Biblical School of Theology (now Biblical Seminary) in Hatfield, Pennsylvania, where he graduated in 1974 with an M.Div. He was ordained in November of 1974 at the Church-Of-God-in-Christ in Philadelphia, PA, where he had been serving part-time while in Seminary. Rev. Becher served as assistant pastor there for several years. He then served in many different areas of Ministry over the next several years, one of which was a foreign student ministry, which is where he met his dear wife, Berenice from Venezuela. They were married in 1980 in St. Petersburg, FL, where they took care of a retirement home, where James was also the Chaplain. In 1989, they went to Venezuela for an extended stay, where, along with teaching English to business people, James completed his purposeful time travel novel, "Impossible Journey." Upon returning to the US, he also completed the Biblical novel, "OF SUCH IS THE KINGDOM," which he had started before they left, and of which the short story, "Beggarman-Thief" was a part. It was published by PublishAmerica in 2003. Also shortly after returning to the U.S., James began publishing his self-help ezine, "Inspirational Success Tips," his articles from which now form his self-help book "Principles of the Kingdom." In November 2012, he preached his "Christmas Victory" message, which resulted in the writing of his latest novel, "The Christmas Victory, A Gem of A Sermon, All Wrapped Up in a Historical Novel." which was published in July of 2014. In 2018, James updated all of his books, publishing 4 editions of"Of Such Is The Kingdom" and also adding a special full-color Christmas Gift Edition for "The Christmas Victory."